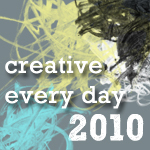 Ways to share: Once you've signed up, you can leave a comment on this post and/or use the "Mr. Linky" widget below to link to a blog post(s) about your creative activities during the days of 8/9/10 - 8/15/10. Theme: The (totally optional) theme for August is the element of Fire. I'll be posting about the theme throughout the month and you can feel free to use it to inspire your creations, follow your own muse, or do some combination. You can find out more about this month's theme and some prompts to get you started with August's theme here. Took a break from making charm necklaces and started a pen znetangle-ish drawing of a girl that reminds me of one of those old psychedelic album covers from the 70’s. Once I completed her hair though, I lost inspiration. Grabbed a glass of wine and got inspired to create a tag instead. I guess as long as you keep the FIRE burning, you can always find another project to start and/or finish right? This week I have three portraits in progress as well as a large Italy scene. I’m hoping to get as many of them finished as possible by the end of the week, plus fit in some smaller works, as well. Full plate! I will attempt some creativity this week, though the body is fighting against me. Fun theme, Leah; I’m having fun coming up with ideas. yah! i’m diving into my creative fire with lots of writing this week. I am working on posting and creating something every day this month. It is the best thing to keep some sort of creative routine. I’m still not quite there. I’m excited to see where I end up, though. Moving between landscape and still life work this week. I am drawn toward the one but feel a strong challenge in the other. Well, there are no literal flames in my art this week, but I’m “on fire” alright — super busy at work! That can be good & bad, but in my case, I’m good if I can still manage to complete some “just personal” art. Thankfully, I did, so that makes it a good week. Hope others fared as well! Finally finished a painting, and I’m feeling great about that. It’s got a great fire and smoke feeling to it that meshes with our Fire theme! It’s actually raining for the first time in weeks, so I’m looking forward to a little less fire today in my life, a welcome break from the heat. I made an intuitive giant self-portrait that I am totally in love with. Phew. So surprised by THAT! I’m in the process of painting Thom Yorke of Radiohead. I think it’s coming along very well. Pleased with the painting so far. How appropriate that my first post here in August has to do with a quilt inspired by the sun, and thus, Fire! Please come and visit my blog, and enjoy the project on my design wall, a Tropical Sundance quilt I’m blazing through! My writing this week goes along with the fire theme well. I am still working on the poem…. Inspired by the fire theme. I’ve started working on a juicy ‘fire’ themed painting and getting lots of ideas for other work! Orange Sun settles on the sea and the sailboats… included image with my new Artist Biography http://creativepotager.wordpress.com/artist-biography that I posted yesterday to support Sept 3rd solo exhibition. It’s been a while since I posted. It’s good to be back!